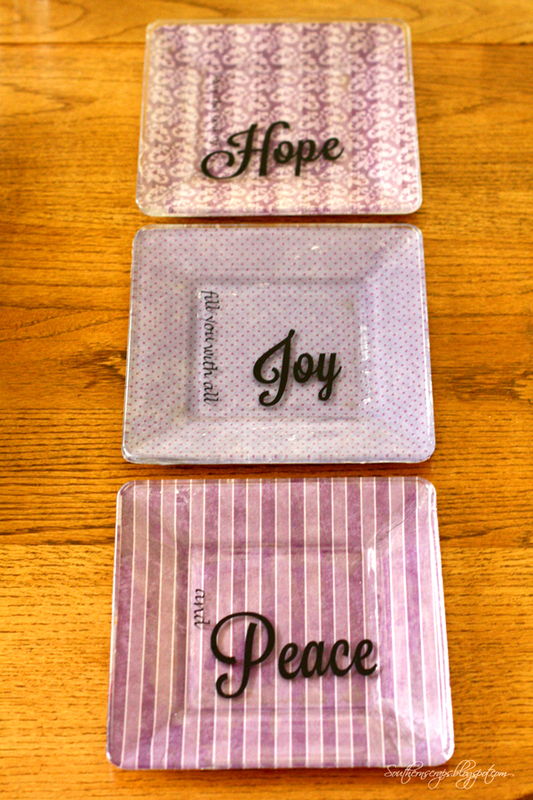 I decided to try my hand at making some decorative plates with clear plates. My mom had seen this idea of using paper or fabric and mod podge to decorate plates in a magazine and informed me that I could make her some so she could change out the Nativity plates she had on display. So I did. 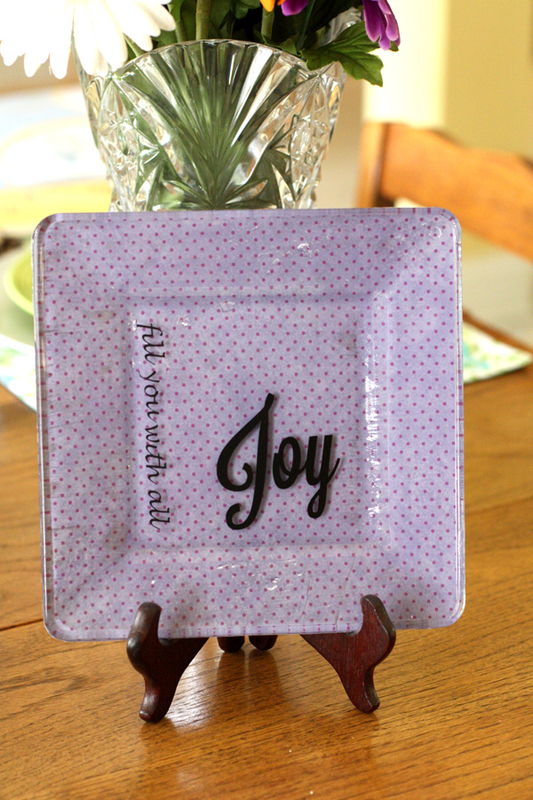 I made her a set of plates for Mother's Day. The Dollar Tree did not have any round plates in the size I wanted so I ended up with these 8 inch square plates from Bed, Bath and Beyond. The were $2.99 each so this was still a very inexpensive project. It was also "easier said than done." Getting the paper on even without wrinkles was a little difficult, but in the end, I was satisfied. I chose three coordinating pieces of scrapbook paper. I chose some thinner paper in my stash. I think it was easier to apply than thick paper would have been. I traced the plate on the paper and then cut it out. 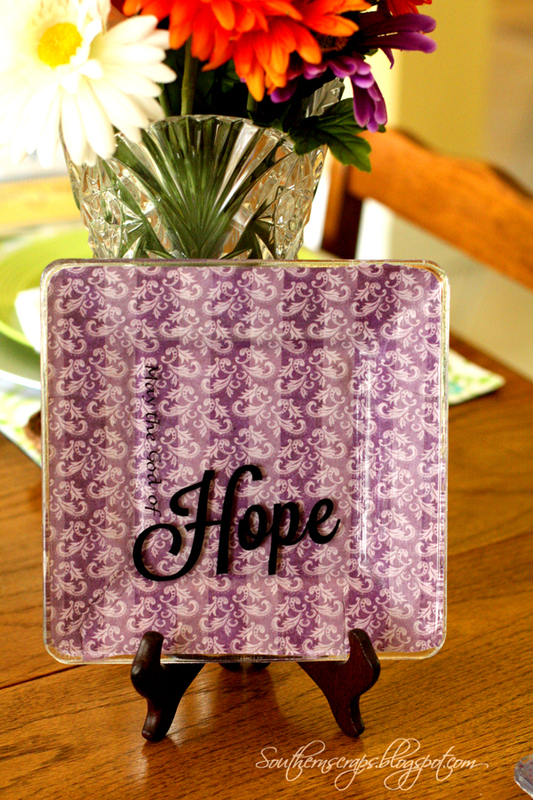 I applied Mod Podge to the back of my plate and the smoothed on my paper. I then applied another coat of Mod Podge to the back of the paper. 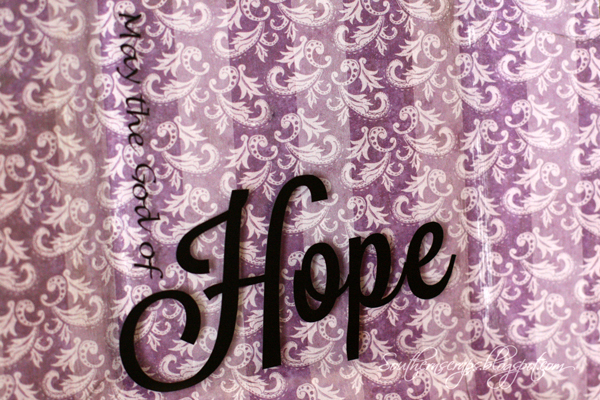 I used the verse Romans 15:13- May the God of all Hope fill you with all joy and peace. 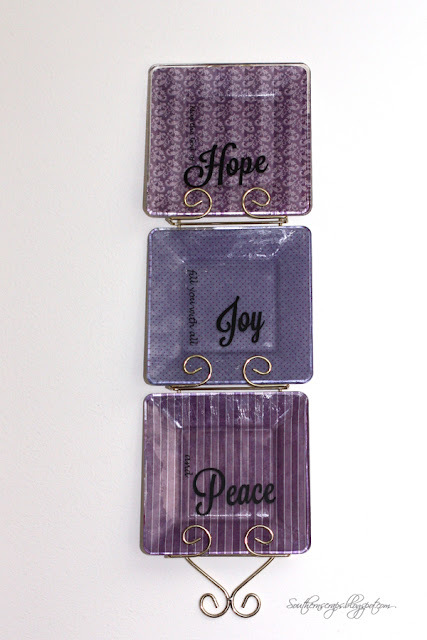 I split the verse among the three plates so I could highlight the words, hope, peace and joy. I cut the words out in vinyl with my Silhouette and applied them to each plate. I think my Mom was pleased. I wouldn't call it my best work, but I was okay with them once they were done. Have you ever felt that way about a project? What a great project! I love how your coordinated with the fun purple papers. Neat! I'm visiting you today from Keeping It Simple. I co-host a Linky Party Tuesday (open thru Sat) and I'd love for you to link up! I hope you get a chance to stop by, link up and leave a comment, too! Very cute! Love it. Found you over at the Tatertots & Jello linky party! 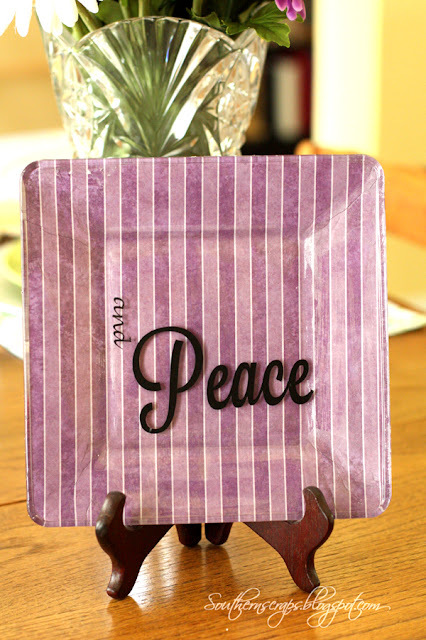 Love what you did with the plates!! I bet your mom loved them!